I had taken to calling my Big Bro “Bother Dear” because he was a dear. A funny, cranky, grumpy, sick dear. I hope he was able to hear the affection that was all wrapped around that phrase as I tried to pretend everything was normal and OK when it certainly was not. As I told you a few days ago he was felling a bit better after feeling really rotten the 25th and 26th. But that didn’t mean things were OK. I spoke to him Friday night and he was sounding a bit perkier. He expressed his concern that he not become a burden on his roommate, Dave. I told him that the hospice social worker and I were working on what should be done and where he should go, the phrase left unsaid was “for your final days.” However, I thought (as did the social worker and my bother’s nurse) that he was OK in his apartment for a few more days. As the end of the call he said he loved us all and I told him I loved him, too, more than once. He fell Saturday morning in the bathroom and forgot that his roommate was in the hospital. The people who live in the apartment upstairs heard him calling and banging on the wall. They called the roommate who called another friend who came and helped Brother Dear up. That wonderful friend kept an eye on Brother Dear while Hubby and I tried to come up with a plan, not so easy on a Saturday. Things like this are also not so easy when you are dealing with an independent smoker who likes his cable TV and has gotten into the habit of sleeping and being awake at all hours of the day and night. In the end, it was all for naught. Sometime between noon, when the friend last checked on him, and 1 o’clock or so, Brother Dear had a heart attack and went quickly and peacefully, lying in bed. I was glad to know he had felt a little better that last day. How did I know? Because my clothes horse bother was dressed very nicely in a coordinating outfit, of course, something he wouldn’t have done if he was feeling like he did a couple of days before. The hospice nurse told me he had told her that he wished he could go quickly in his sleep. Well, it looks like he got his wish. I hope the bright light and all who have gone before called him to their side and he is well and at peace. Good bye, Brother Dear. I am (not) dyeing to see how it looks! I decided to stop dyeing my hair, and it is all because of Wheel of Fortune. I was at the gym doing my 20 minutes on the recumbent bike, watching Wheel of Fortune on the TV screen above my head. It was couples week and one of the women who looked to be in her 50s had hair that was au natural. It inspired me. The next day I had my regular cut and color appointment and I told Candy (my awesome hairdresser) to skip the color! I have been contemplating this for a while now. I am 52, folks. I get tired of spending the time and money on the hair color. In order in minimize the obvious regrowth Candy and I had settled on a very light blond anyway. So I was just one step away from a snowy top. I see lots of women who have let their hair go grey or while and I think it looks great. So what the heck, in 2014 I am embracing the real me, at least from a hair standpoint! However, you may be reading another blog post in four or six months telling you how I stopped embracing the real me. We shall see…. Folks, I wasn’t sure how Christmas was going to be this year. With the recent passing of Hubby’s mom and the illness of Big Bro, it had the potential to be a pretty sad season. But things have a way of working out and I am happy to report that we had a very nice Christmas Eve and Christmas Day, in spite of it all. We thought Big Bro would be joining us Christmas Day but he just wasn’t feeling well enough to come over to our house or to have us bring dinner to him. That was very sad and disappointing for me in particular. It looked like it was just going to be the four of us around the Christmas dinner table, something that had never happened before. Then, about 12:15 or so one of Eldest Daughter’s friends stopped by. Eldest thought she would be coming later in the day so it was a surprise for all. She joined us when we tried out a new board game that had been under the Christmas tree and, as dinner time approached (we usually eat about 2 p.m.) I asked if she wanted to join us. Since her family had already celebrated on Christmas Eve, she was happy to be offered dinner. We were all thrilled to have another person at the table. She is a perky sort, so conversation never stopped. As I said, things have a way of working out. It looks like Big Bro is feeling a little better today, so the crisis has passed for now, I am happy to report. A Warm and Furry Chrstmas to You! I went looking on Flickr for something I could use to wish all of you a wonderful Christmas. 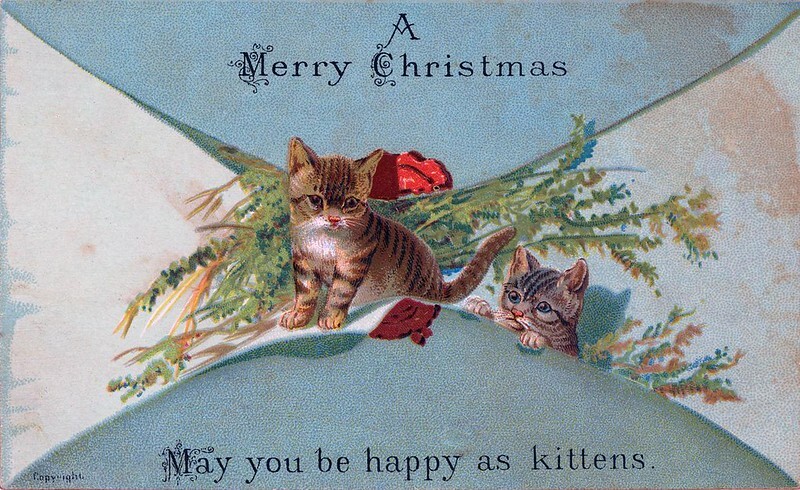 I found a Victorian Christmas card that I absolutely couldn’t resist. Wishing you all a warm and furry Christmas and a truely wonderful 2014!!!!! Just in case you have a party or family get together planned around Christmas time, I tought I would share this fun game with you. I saw Youngest Daughter and her friends playing it as a party and immediately stole the idea and used it at a friend’s Christmas party. It was a hit and has been requested ever since. It works best if everyone can sit around a table or sit in a circle on the floor. Probably somewhere between 6 to15 players would be ideal. -various wrapping papers, newspaper, as well as a small box or two. Wrap the gift in the paper and boxes one layer at a time. The game lasts longer if you use lots of tape. I often save wrapping paper to reuse for this purpose. The purpose of the game is to try to unwrap the present while wearing the oven mitts. To play the game: Pick a person to begin rolling the dice. Pass the dice around the table, each person getting one roll at a time. When a person rolls doubles, they get to put the oven mitts on and begin trying to unwrap the gift. They get to keep trying until the next person rolls doubles. Then the gift and oven mitts are tossed to the new person and they get to start trying. The rest of the table will be passing the dice and rolling as quickly as possible, trying to get the magic doubles so they get a try at unwrapping the gift. The person who unwraps the gift from the last layer wins the prize. This game is loud and fun, perfect for a party of any age group, except very little children. You will be amazed at how creative people get trying to unwrap each layer with those oven mitts on! Thanksgiving was late this year and with every thing else going on in our lives Christmas is getting going later than usual at my house. Hubby and the girls insist on a real tree. I agree a real tree is lovely. It is fun to go to the tree lot to pick one out. It is enjoyable to smell the real tree in the living room. But it can be very stressful finding time to buy the tree and set up can be a real bear. Friday night I hustled Hubby out to the only tree lot in the city. Trees were a bit more expensive that I am used to paying but, hey, we were there and we were going to get a tree! Once we got it home and Hubby grabbed it out of the truck he borrowed from work, he discovered that the tree we purchased was VERY heavy. This certainly complicated things. It also had quite a large trunk, which complicated things even more. To add to the whole situation, one of our Santa Ana winds was blowing and we had to find a place to put the tree where it could wait (and not blow away) until we found time over the weekend to set it up in the livingroom. Saturday night Hubby laid the tree on its side so he could cut off the bottom of the trunk. He was still wondering if that big trunk would fit in our tree stand when he realized he could just pick up the stand and slip it on the trunk to see if it would fit. Brilliant! As we contemplated the heavy beast, I had another idea, inspired by his. While the tree was relaxing on the patio, why not just put the stand on it and carry tree and stand into the house together. Then, once we stood it up, we could adjust it to make it straight. Hubby agreed that seemed like a workable plan and that is what we did. People, the process went so smoothly we both just about smacked our foreheads and said “Duh!” Twenty-seven years of setting the stand just so on the floor in the living room, and then wrestling the live tree in the door and into the stand flashed before our eyes. What a time-consuming pain! Why had we not thought of laying the tree on its side and putting the stand on it before? IT only took 27 Christmases for this idea to come to us! Oh well, I think we have many more to implement our new idea! This is our tree from two years go, one we wrestled into place. 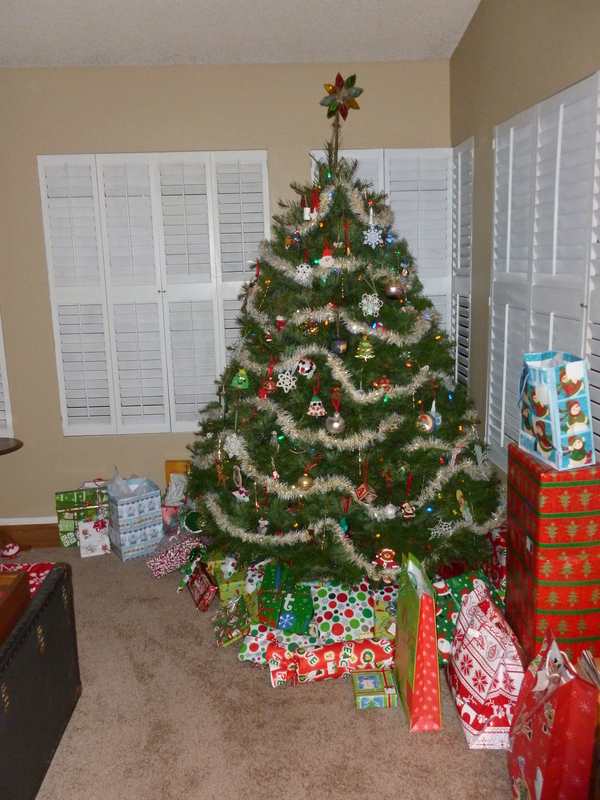 Gosh, look at all of those presents! Less shopping has happened this year, so not quite so many under the tree in 2013. What is it about Christmas and new bicycles that is so often intertwined? I received a two-wheeler bike when I was seven or so, but we lived in a hilly area and I never learned how to ride it. Fast forward four years and we moved to a neighborhood filled with flat streets and kids who rode bikes all the time. How embarrassing to be the only one who didn’t know how to ride a bike! With the motivation to fit in biting at my tail, I learned to ride my bike with the help of the other kids. Of course, that little bike was now much too small for me, but my Dad put the seat in the highest position and like kids everywhere, I adapted, riding with my knees up around my ears. I rode that bike for hours and as Christmas approached I began to long for a bike that was bigger, a more appropriate size than the little one bought when I was seven. There was just one problem. My parents were not making much money right then. My Dad had been laid off from his aerospace job a couple of years before and we had moved so he could go into business with a friend. That wasn’t working out so well and my mother was commuting about 45 minutes each way to a bookkeeping job that was our primary means of support. My Mom explained that there probably wouldn’t be enough money for a new bike. The money problems were true but I don’t know if Mom told me the story about not being able to afford the bike to thow me off the scent or because she didn’t want me to get my hopes up. What ever the case it worked and I did not expect a bike under the tree that year. Christmas morning, even though I was 12, I still got up before my parents did and raced to the front of the house. There, to my surprise, was a nice big bike. I gasped! I was so shocked! I tried to be quiet since it was so early but it was all I could do to not start doing a loud and gleeful happy dance! But I learned later that the best part of my bike was the story behind it. My Mom bought the bike unassembled, probably because she and my Dad thought they could save a few dollars on the assembly charge. My Dad was handy with tools so I am sure he thought it wouldn’t be a problem. After I went to bed he began trying to put the bike together at our neighbor’s house. Unfortunately he ran into some problems. The neighbors (who were also our friends) tried to help but they ran into problems, too. So someone decided to get the teenage boy from across the street, whose name I still remember: Peter. He came over and between Peter, the neighbors, and my Dad the bike was finally put together. My Mom told me this later, as a “you won’t believe what we went though” story. But I didn’t see it that way. What I saw was a neighborhood coming together to help my parents give me what I wanted most in the world for Christmas. The bike and what it took to put it together for me became one of my most precious Christmas memories. Just a couple of months ago I was reading a local history book about the area we lived in at the time. Imagine my surprise when I saw several pages of photos of Peter, his parents, and their extended family, who farmed in that area. It was nice to see and be reminded of that Christmas when I was 12. Hubby’s mother passed away on November 22nd. We are all still in shock I think. I am finding it difficult to go over to her house because she was there and then she wasn’t and her stuff is still everywhere, just as she left it. On Wednesday I was there to meet with a contractor and after he left I was trying to do a few things to move the process along, so to speak. First I gathered some trash together as the next day was trash day. Then I decided to poke around in the bathroom. I thought if Mom in law had some unused soap or toothpaste this was a good time of year to gather that together for donating to local charities. One thing you have to know about my Mom in law is she looked AMAZING for her age. 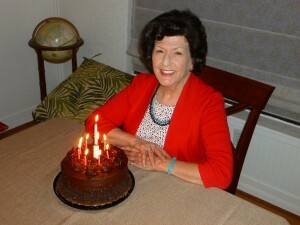 The photo below was taken in February at her (I kid you not) 79th birthday. FYI, you ladies, that was her natural hair color. She didn’t have a gray hair until she was 70. People who look that good work at it and Mom in law was always very put together, lipstick in place, clothes and accessories beautifully color coordinated and the whole nine yards. This taste for beauty carried over into other parts of her life as well. For example, when she wrapped a present it was always just so with beautifully coordinated bows and paper and tissue. So, it was with a determined but hurting heart that I dug into the bathroom cabinets. I had noted that there was a bar of pink soap next to her sink, which coordinated nicely with her pink and maroon bathroom. Well, when I opened a bottom cabinet I saw a couple of bars of pink Dove Soap and then a couple more, and then a couple more! I realized she must have used Dove soap to wash her face and liked the color of the pink version. Mom in law must have liked how the pink soap looked next to her sink a whole lot better than how the plain white soap looked and she bought a decade’s worth or so to make sure she didn’t run out of that pretty pink soap any time soon. That was so like her I had to laugh. I brought all the soap home with me and told my family about it. They had a chuckle, too. I am still going to donate all of that pretty pink soap. It gives me great pleasure knowing that a down on their luck family will be enjoying it soon. But I wanted to write down the story of the pretty pink soap. It is a good memory. As I was stepping out of my car today after arriving home from work, a rather disreputable man in a small white beat up pick up truck pulled up and said, “Do you like steak?” “No thank you,” I replied in my chirpiest voice. How about shrimp, do you eat shrimp?” he countered. “No.” I chirped again, “I don’t eat shrimp.” The disreputable fellow began to get a little cranky looking. “You’ve bought from me before! It was a while back.” he said, with emphasis. Now I understood. “I just moved here a few years ago. You must have dealt with the person who lived here before.” I was starting to get a little nervous. This man was looking unhappy with me. But I refused to be bullied into buying his meat products. Thank goodness my last explanation sent him on his way. Maybe he thought I was a vegetarian, or, god forbid, a vegan. Believe me, I would weigh a lot less if I was. But I am not. I like meat. I don’t like shrimp (bugs of the sea I call them) but I enjoy a good steak. But buy meat from a person who looks just this side of homeless out of an old truck? I don’t think so! I have experienced food poisoning and it usually comes riding in on a piece of meat. Also, not being a trained butcher or veterinarian, how can I tell what I am buying? Is it really beef? Sorry buddy, but if my choices are go meatless for tonight’s dinner or buy my steak from you, I think it will be a meatless night. Have you (or would you) ever buy meat from a guy who pulls up to the front of your house in his truck?